TurboTemp2 offers great aesthetics, perfect fit, a precise set time and almost no sticky layer. Danville guarantees TurboTemp 2 to be equal or superior to any material, at any price or you money back! With only 0.4% shrinkage, fit and occlusion is perfect. 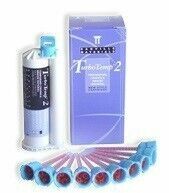 High flexural strength further makes TurboTemp 2 the best choice. Syringable, Bis-Acrylic composite. True Vita Shade match. Jumbo, 76gm cartridge with 10 tips..
Take impression prior to prep. Danville Monophase is ideal for use. Syringe TurboTemp 2 into impression and place over prep. Let partially set. Remove after 1½ minutes and cut away flash. Replace in mouth until complete set is achieved, no more than 4 minutes from start has elapsed. Clean, polish, place and cement to allow full cure in 4 minutes. Restoration will harden in place. Trim and polish or allow full cure in 4 minutes. Restoration will set in place. Trim and polish.